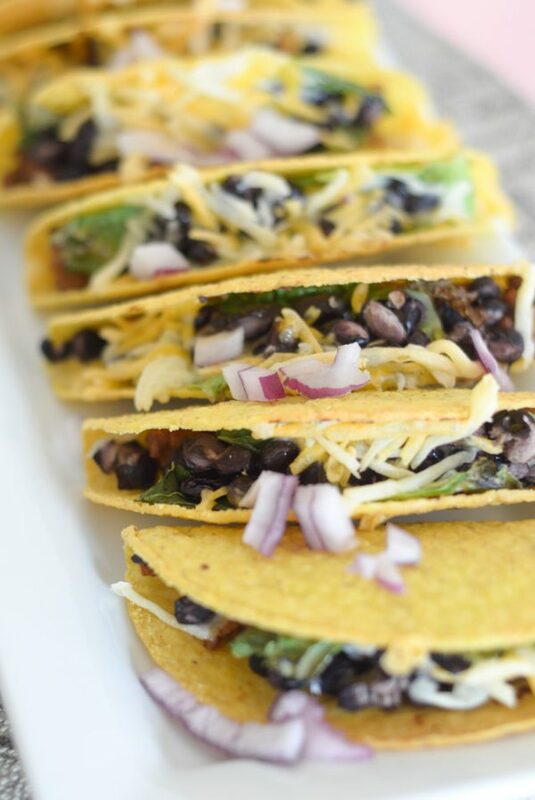 Air Fryer Tacos are the PERFECT choice for Taco Night. These tacos are so warm and crispy, you’ll never go back to traditional tacos. 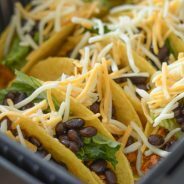 These are similar to doing Oven Baked Tacos; however, if you use the air fryer it’s going to give them a much more crispy taste. They tasted more like restaurant style tacos. I happened to be making tacos for dinner, then thought we should try the Air Fryer with them, I was beyond surprised. It’s time to make Air Fryer Tacos. We didn’t have a single taco left! Normally, we always have a few left, I think we all lost count of how many my husband ate. Of course, he did work all day, my son was following close behind. Anyone have boys? Our son is suddenly starting to eat us out of the house! My sister has 5 boys…can you imagine? Oh my! I can barely keep up with just my husband and son. I feel like every week, our grocery bill just gets higher and higher. It’s honestly ridiculous. We may have to start rationing snacks or something. Any good snacks that fill them up? I’ve started limiting snacks or at least trying to encourage more fruit and veggies. I probably need to get some different snacks too. I’m anxiously awaiting our garden, free produce at hand in my backyard…YES! I can’t wait. I’ll be sharing more on our garden planning soon too. 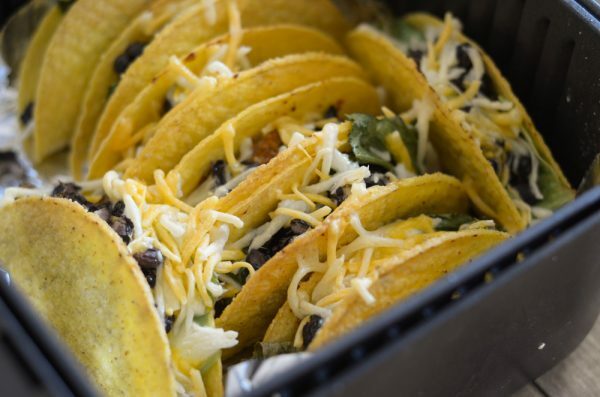 What do you need for Air Fryer Tacos? 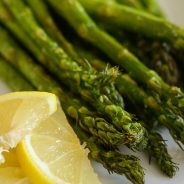 Do you add the toppings in before you put them in the Air Fryer? First, we love to completely fill our tacos before putting them in the air fryer. Yes, that means lettuce, cheese, and all the goodness. I have found that the lettuce still tastes great because they aren’t in the air fryer very long. If you don’t want to do that though, feel free to simply add in the taco meat to the shell. Once that’s added, warm them up and carefully remove and fill with your favorite toppings. It can be done EITHER WAY…so do what you prefer. Now, let’s talk about this Air Fryer. Hopefully you aren’t getting too tired of the Air Fryer recipes, honestly, it’s my favorite appliance. I have nearly worn it out because we use it so much and Air Fryer Tacos are almost always on our menu for Taco Tuesday. I have been using it nearly every night for dinner, it just makes dinner so quick and tasty too. 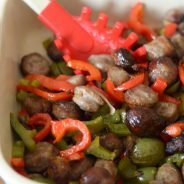 Be sure to try these Air Fryer Bratwurst and Vegetables too! 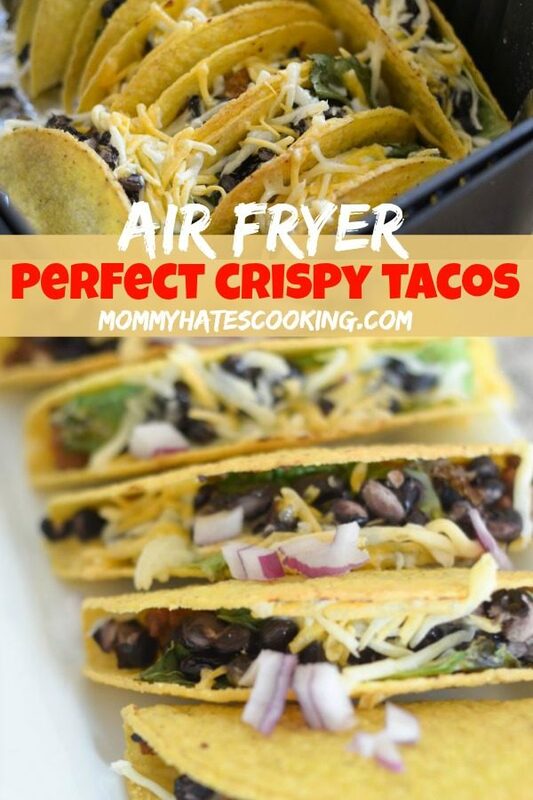 What type of Air Fryer can you use for Air Fryer Tacos? Our Air Fryer is a 3.7L and I was able to fit 8 tacos into the Air Fryer, then I did 4 more after too. They only take about 4 minutes in the Air Fryer and you will be totally done and ready for dinner. I have actually been looking at purchasing the new Ninja Air Fryer that is also a Pressure Cooker too. Honestly, I think it’s genius, one appliance that literally does it all. I mean honestly, with that you won’t even need a stove or oven! We served ours with some veggies and rice to complete the meal. 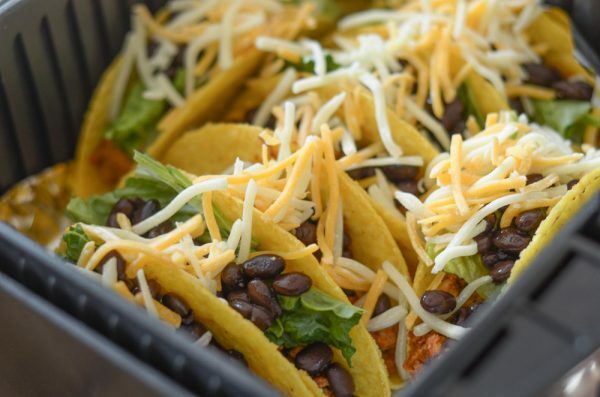 Now, it’s time to eat up with these Air Fryer Tacos. I hope you enjoy them as much as we did. 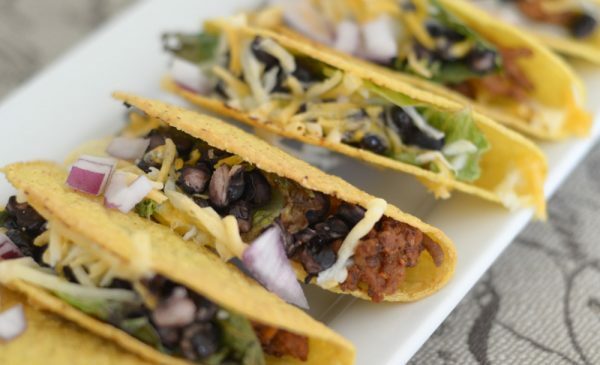 Make a quick, easy dinner with Air Fryer Tacos. In a medium sized skillet, add the turkey and brown. Drain if needed, add in the taco seasoning as instructed on the package. Build taco with the shell, cooked meat, lettuce, beans, and cheese. Add the tacos to the air fryer. It's best to foil line it and then spray with non-stick cooking spray. Note - Adding foil is optional if you do foil line the basket of the air fryer be sure not to fully cover it in order to allow the air to still flow. We LOVE to top ours with all our ingredients, and then toast them in the air fryer; however, if you prefer you can add toppings after. 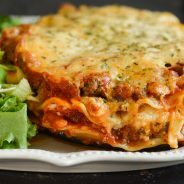 If you do this method, add the beef in the shells, warm them up for the 4 minutes at 355 degrees, and then remove and top with your favorite toppings. I LOVE LOVE LOVE the idea of baking the shells in the air fryer. I think Saturday will be Taco Day so I can try this. This will be great for summer time when we don’t want the over on. Thanks for sharing!!! It’s so perfect for the summer! You’ll love them super crispy! I do, but that’s totally up to you! Since they aren’t in there long, the lettuce still taste just fine to me. Do you cook the taco shells first, then fill & cook in the air fryer? No, I don’t, I buy the crispy taco shells and just put them in the air fryer. Just watch it after about 5 minutes b/c they cook quickly. Have you ever used corn tortillas instead of the taco shells in the air fryer? If so how did you do them? I just got a air fryer and we are trying to use it on different things. I have used corn tortillas in there, I just do them for about 3-5 minutes. I warm them up for about 30 seconds in the microwave to be able to work with them more. I’d suggest just doing them in there maybe 2-3 minutes and check them then do additional time if needed. These are so good and easy to make! I never thought to make tacos in my air fryer! Perfect idea. 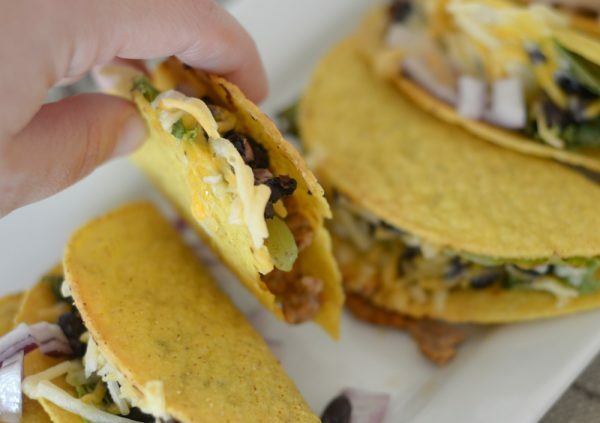 This recipe is perfect for my taco crazed family! They couldn’t get enough of them! I have the Power Fryer XL with the slide out basket do you use the cake pan it came with or the basket with holes in it? You said to use foil but doesn’t that block air flow if I use the basket? Use the basket with the holes in it, you don’t have to use foil. I like to just so it’s less mess if the cheese falls off or something like that. I make sure to roll it up on the sides so that the air is still flowing, just be sure not to fully cover the bottom. How do you shape the taco shells in the air fryer. I use the crispy shells and just prop them up next to each other. The 2nd picture in the post is what they look like when I put them in the air fryer.